This document, calling for more Volunteers to join up, was specifically directed at raising numbers in Rangoon. ​However it is clear from the text that similar exercises must have been taking place throughout Burma. Extract from the proceedings of the Chief Commissioner, Burma, in the Military Department, - No. 39V., dated 1st October 1891. RESOLUTION. - The Chief Commissioner desires to invite the attention of the European residents ofRangoon to the present state of the Rangoon Volunteer Rifle Corps and of the Rangoon Volunteer Artillery, and to the urgent necessity which exists for placing the defence of Rangoon upon a more satisfactory footing so far as this depends upon the organisation of the auxiliary forces. 2. There are, according to the Census returns, about 1,700 adult males of the European and Eurasian civilcommunities resident in Rangoon. The number of adults on the rolls of the Rangoon Volunteer Rifles was recently 330, on the rolls of the State Railway Volunteers 100, and on those of the Rangoon Volunteer Artillery 53. It may be said roughly that only one man in four capable of bearing arms is serving as a Volunteer. Nor do those who thus refrain from serving themselves do anything to support the movement in other ways. The only band attached to the Rangoon Volunteer Rifles is that of the Cadet Company furnished by St. John's College, while the band of the Railway Volunteers is badly supported and on the verge of extinction. (a) The maintenance in good order of rifle, ammunition, and uniform, if any. (b) Attendance in uniform, if any, fully accoutred, whenever summoned by competent authority, save when prevented by duty to employer, sickness, or other unavoidable cause. (c) Attendance at only such drills and instructions as are necessary to ensure the proper use and care of rifle, etc. (d) Completion of a simple musketry course involving the firing of 15 rounds only. (e) Notification of changes of residence to the Regimental authorities. Gentlemen willing to join the Reserve are invited to send in their names to the Commissioner of Pegu or to the Officer Commanding the Corps to which they wish to be attached. 4. The Chief Commissioner is anxious, however, on the present occasion to draw special attention to theimportance of strengthening the Artillery Corps and raising a corps for the naval defence of the port. It was intended that the Rangoon Volunteer Artillery should aid the regular garrison in working the heavy guns, and that a force of about 120 naval volunteers should be raised to man the launches and boats and assist in the submarine work. 6. The Volunteer Artillery, at one time a fairly flourishing corps, has unfortunately been allowed to fall away,and recently, as above shown, consisted of only 53 officers and men, of whom only 30 were efficient. It is of great importance that this body should be once more raised to its proper strength. But it is still more important that this corps should be made the nucleus of a Defence Corps for all the purposes of the port. There ought in short to be two companies, A. and B, one for artillery work ashore and one for work afloat, the uniform of the River company being of a naval rather than of an artillery pattern. 7. The Secretary of State has now sanctioned the appointment of a seconded Captain as Adjutant of RoyalArtillery at Rangoon who, in addition to his other duties, will act as Adjutant and Gunnery Instructor to the Artillery Volunteers here. and for the provisional appointment of the Port-Officer, Captain Falle, to be Commander of the Naval Company, in order that the full assistance derivable from the Government Marine establishment may be rendered to the corps. Major Temple's appointment will be gazetted at once. Captain Falle's appointment will be gazetted as soon as a sufficient number of men have been enrolled in the Naval Company. The Naval Company will be attached to the Volunteer Garrison Battery for administrative purposes. 9. The Chief Commissioner feels sure that Major Temple and Captain Falle, with the co-operation of theleading merchants and other non-officials, will very soon be able to raise a corps such as is required. He invites the European residents of Rangoon to come forward to assist in placing this Port Defence Corps on a sound and permanent basis. He would suggest that special facilities should be given to employees desirous of joining either the Port Defence Corps or the ordinary Volunteers. He would also remind the well-to-do members of the community that there are many expenses incidental to the proper working of a Volunteer Corps which ought not to fall upon the officers. Subscriptions to the funds of both corps might properly be invited from the general public of Rangoon. Unfortunately the law does not allow the Municipality to contribute. 10. For the rest the Chief Commissioner[of Burma]is endeavouring throughout the stations of the interior toinduce all European Government servants to belong either to the Volunteers or the Reserve. The same principle ought to be applied in Rangoon. 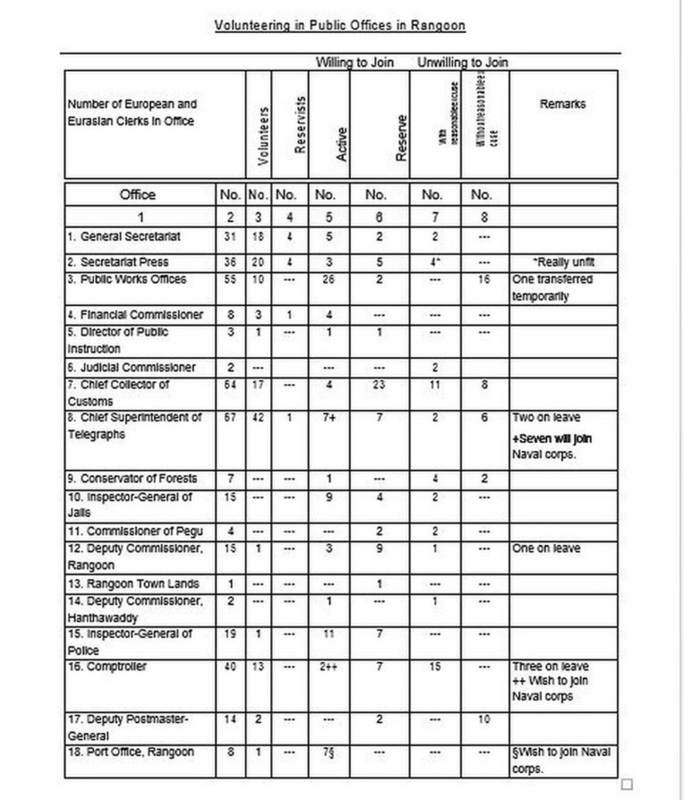 Heads of Departments will now be directed to prepare returns showing the number of European and Eurasian clerks in their offices, and the number who or are prepared to serve as Volunteers. Men who are too feeble or too much occupied to be Volunteers ought to be pressed to become Reservists. 11. It must be clearly understood that every Head of a Government office is bound to allow Volunteers on hisestablishment time to attend drills and parades. The Commanding Officers are invited to report to the Chief Commissioner any cases where this order is not attended to. 12. The Chief Commission considers further that the officers of Volunteers should be encouraged to maketheir headquarters a pleasant place of resort for the men in the evening. Possibly evening drills might suit the convenience of many. But apart from drill the Volunteers should be encouraged to meet in such social gatherings as smoking concerts, or for the discussion of papers on professional subjects and for such like purposes. It is in the encouragement of the social life of the corps, as well as for the upkeep of a band, etc., that subscriptions could best be utilized. Superintendent, Government Printing, Burma, for publication in Supplement of Burma Gazette. All Editors of European newspapers in Burma, Commissioner of Pegu and all Heads of Departments in Rangoon, for information and guidance, and in order that the returns referred to in paragraph 10 of the Resolution may be prepared and submitted without delay. All other Commissioners and all Deputy Commissioners for information and guidance. Officers Commanding Volunteer Corps in Burma for information. RESOLUTION - The returns called for in paragraph 10 of the Chief Commissioner's Resolution No. 39V,dated the 1st October 1891, have now been received and the results are summarized in the table attached to this Resolution. The Chief Commissioner is glad to see that, except in the Public Works Department and in the offices of the Deputy Postmaster-General, the Chief Collector of Customs, the Chief Superintendent of Telegraphs, and the Conservator of Forests, every able bodied European and Eurasian clerk in Rangoon has either already joined or has expressed his willingness to join the Volunteer movement. Sir Alexander Mackenzie hopes that the heads of the five departments named above will endeavour to remove the discredit which must attach to their offices so long as any members of their staff hold aloof from the movement. 2. The Chief Commissioner has accepted for the present such entries as "ill health" "general decrepitude"and the like as affording reasonable excuses for not joining the Volunteers. At the same time it seems necessary to call the special attention of the Comptroller and the Chief Collector of Customs to the extraordinary prevalence of weakness and debility in their offices. If for instance it is really the case that 15 clerks out of 40 in the Comptroller's office are physically incapable of even joining the Reserve, it is to be feared that the work of the office must suffer. The necessity for gradually weeding out the physically incapable should be borne in mind. 3. The obligations to be undertaken by Reservists have recently been modified. A copy of the latest orderson the subject is attached to this Resolution. Heads of offices are requested to see that the members of their establishments who have declared themselves willing to join the Volunteers do not fail to do so; those who have not yet promised to join should have their attention called to the provisions of the Army Circular attached to this Resolution. The Superintendent, Government Printing, Burma, for publication in Supplement of Burma Gazette. All Editors of European newspapers in Burma, Commissioner of Pegu and all Heads of Departments in Rangoon, for information and guidance. All other Commissioners and all Deputy Commissioners for information. Officers Commanding Volunteer Corps in Burma for information. The attention of the Government of India having been drawn to the disproportion (Clause 161) which exists in many districts between the number of enrolled Volunteers and the available adult European population, it is deemed necessary to urge upon all, who from any cause are unable or unwilling to become active Volunteers, the expediency of joining the Volunteer Reserve in order that they may be organised as a valuable part of the Volunteer system. 1st. - He shall maintain, in good order (if in his possession) his rifle, ammunition, and accoutrements. 2nd. - He shall attend, in cases of emergency, when summoned by the Chief Civil Authority of the District, or Commandant, of the Corps to which he is attached, or the senior member of the Reserve on the spot. 3rd. - He shall deliver his arms and ammunition in good order (reasonable wear excepted) to the authority appointed to receive them, on leaving the volunteer district, or on resigning his membership. 4th - He shall notify to the regimental authority all changes of residence. 45. "At the commencement of each financial year Rs. 10 will be paid by Government as an annual capitation for each Reservist in respect of whom the Commandant can certify that such Reservist is acquainted with the proper method of keeping his arms, accoutrements, and ammunition in proper order; that his arms, etc., were in good order when inspected by the person appointed to do so; that he has executed the musketry course laid down in paragraph 40, and that he has attended, inclusive of parades for musketry, seven parades or drills during the preceding twelve months. The capitation grant will be drawn by the Commandant of the Active Corps to which the Reserves are attached, who, after defraying any expenses properly incurred on account of the Reserves, may treat the balance as part of the capitation grant of the Active Corps." In the case of Reserve Corps which are not attached to active Volunteer Corps, the capitation allowance will be drawn by the Commandant of the Reserve Corps and expended for his corps in accordance with the rules prescribed in paragraph 460 of Army Regulations, India, Volume IX.